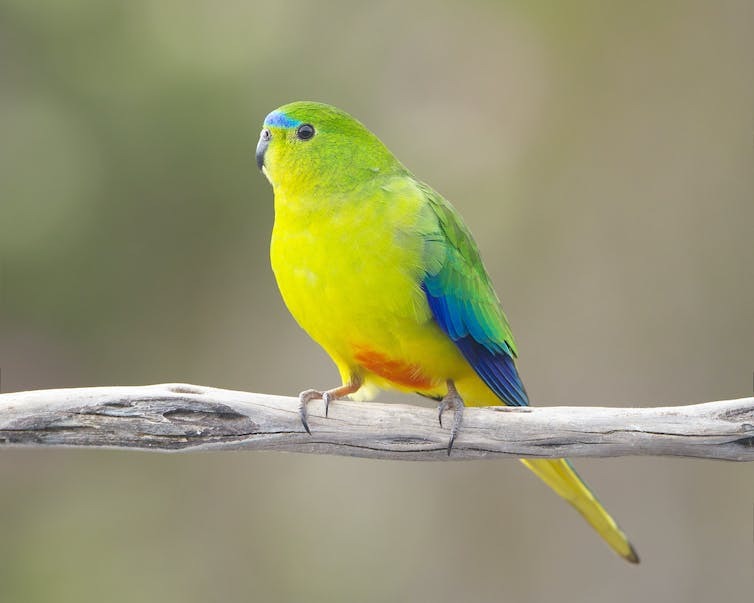 Orange-bellied parrots are one of the species included in the government’s Threatened Species Prospectus. Southern cassowaries, orange-bellied parrots, Leadbeater’s possums, and Australia’s only purple wattle are among the threatened species the government is seeking conservation investment for under its recently released threatened species prospectus. The prospectus seeks business and philanthropic support in partnership with the government and community groups to raise around A$14 million each year. 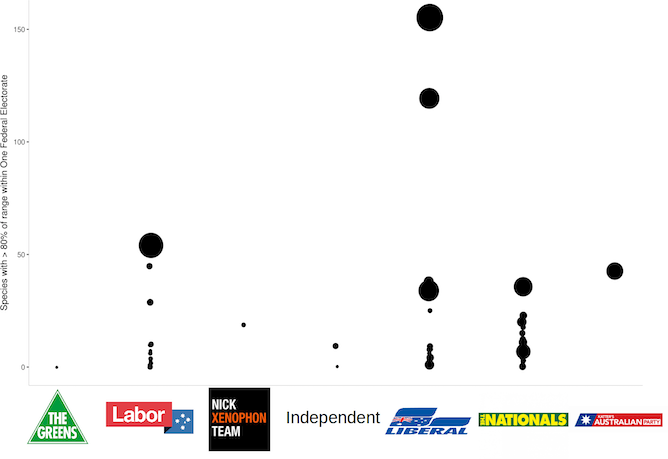 The government has proposed 51 projects, costing from A$45,000 to A$6 million. At first glance the prospectus is a positive initiative. 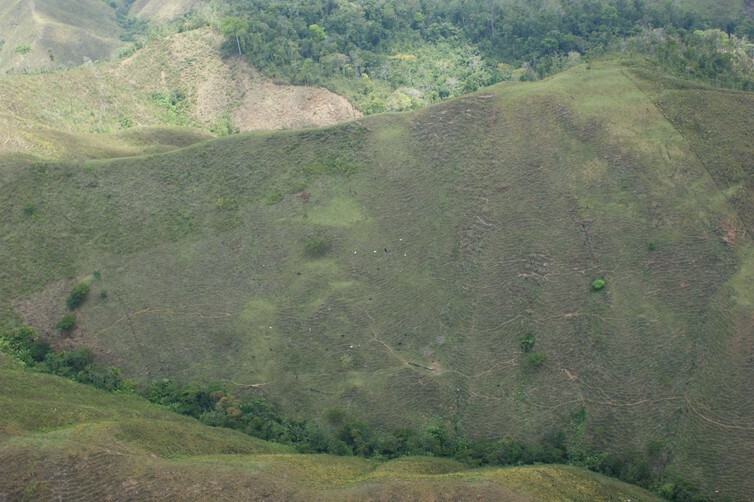 But it also highlights that the current government is unwilling to invest what’s needed to assure the conservation of our threatened plants, animals and other organisms. The government’s partial outsourcing of conservation investment and responsibility might have some benefit. Raising broader awareness about the plight of Australia’s threatened species, particularly among Australia’s leading companies and donors, could lead to valuable conservation gains. It could translate to pressure for greater financial investment in conservation and less damaging actions by big companies. The prospectus includes an excellent range of critically important projects. These include seed banks for plants facing extinction, and projects to control feral animals and create safe havens for mammals and birds. These projects could help to save species on the brink of extinction, such as the critically endangered Gilbert’s potoroo, the Christmas Island flying fox and the orange-bellied parrot. The projects have a high chance of success. Community groups and government are already on board and ready to take action, if only the funds materialise. Why do so many species need urgent help? The State of the Environment Report released in early March shows that the major pressures on wildlife have not decreased since 2011 when the previous report was released. 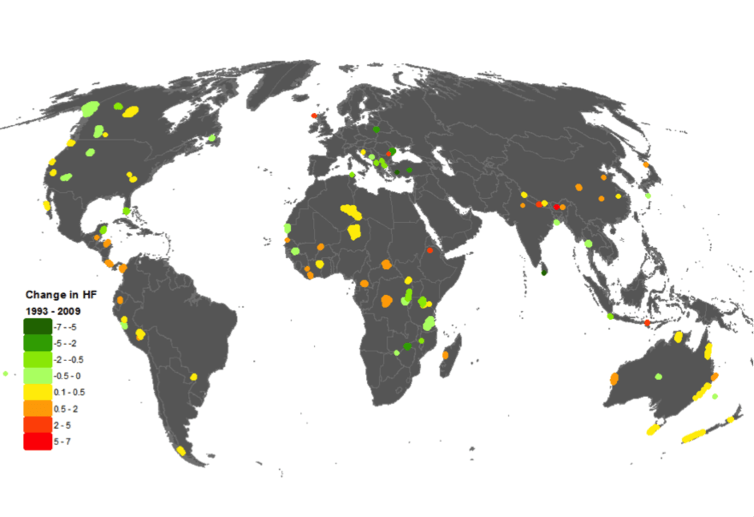 The prospects for most threatened species have not improved. 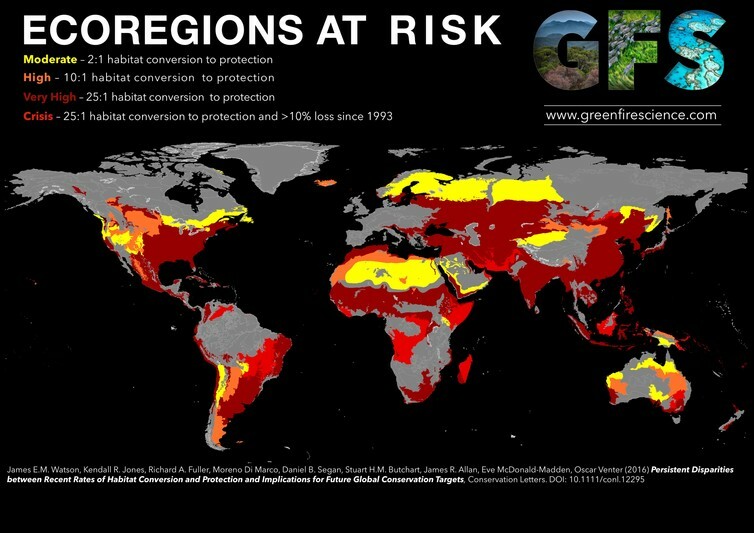 Habitat loss is still the biggest threat. 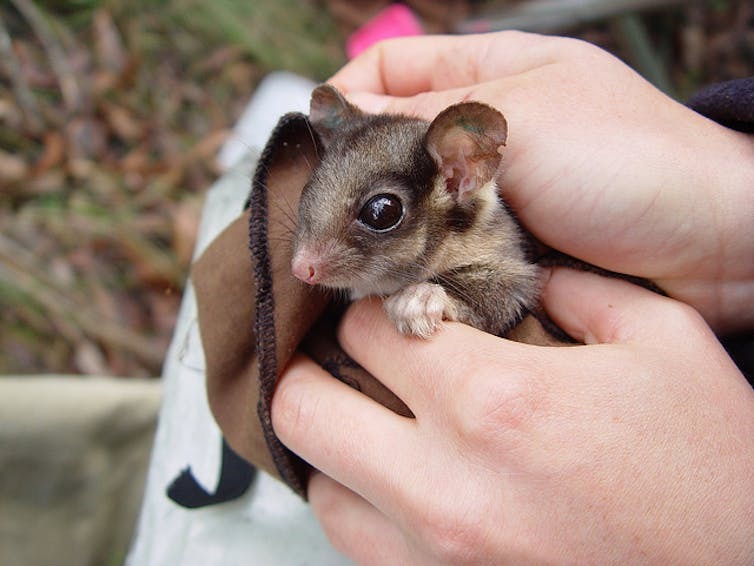 The homes of many threatened species are continually under threat from developments. Coal mines threaten the black-throated finch, urban sprawl eats away at the last 1% of critically endangered Victorian grasslands, and clearing for agriculture has spiked in Queensland. 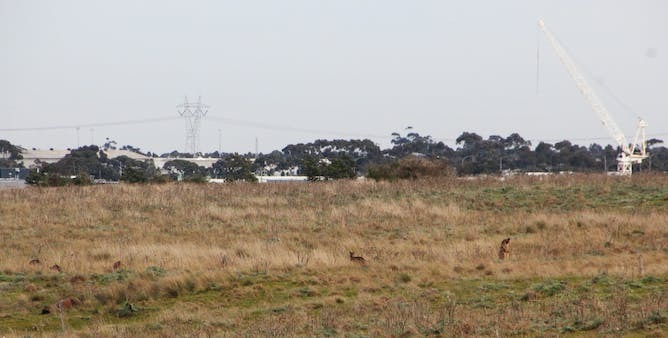 Grasslands, such as these in Melbourne, are being lost to development. Feral animals are widespread and control programs have been inadequate. New diseases are emerging, such as the chytrid fungus that has devastated frog populations worldwide. The horticulture industry, for example, introduced myrtle rust to Australia. The disease was poorly managed when it was first detected. It now infects more than 350 species of the Myrtaceae family (including eucalypts). 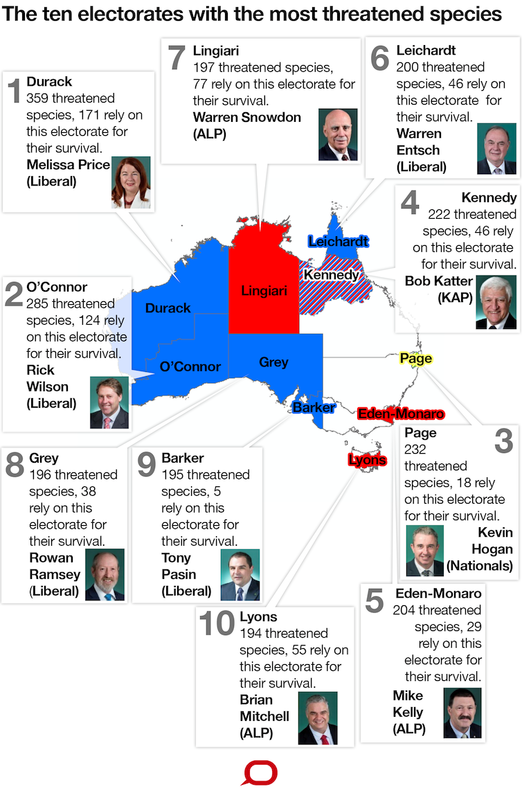 We have so many threatened species because national and state governments don’t invest enough money in protecting our natural heritage, and environmental protections have been rolled back in favour of economic development. Over the past three years the federal government has invested A$210 million in threatened species. This annual investment of A$70 million each year is minuscule compared with the government’s revenue (0.017% of A$416.9 billion). It includes projects under the National Landcare Program, Green Army (much of which didn’t help threatened species) and the 20 Million Trees program. The A$14 million that the prospectus hopes to raise is a near-negligible proportion of annual revenue (0.003%). Globally, the amount of money needed to prevent extinctions and recover threatened species is at least ten times more than what is being spent. In Australia, A$40 million each year would prevent the loss of 45 mammals, birds and reptiles from the Kimberley region. 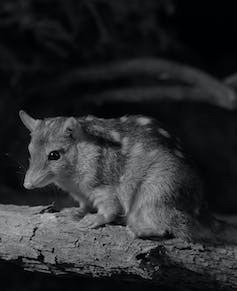 Most species in the government’s threatened species strategy, like this northern quoll, are charismatic. The inescapable truth is that Australia’s conservation spend needs to be in the billions, not the current and grossly inadequate tens of millions, to reverse the disastrous state of the environment. Can we afford it? The 2016 Defence White Paper outlines an expansion of Australia’s defence expenditure from A$32.4 billion in 2016-17 to A$58.7 billion by 2025, even though the appropriate level of investment is extremely uncertain. 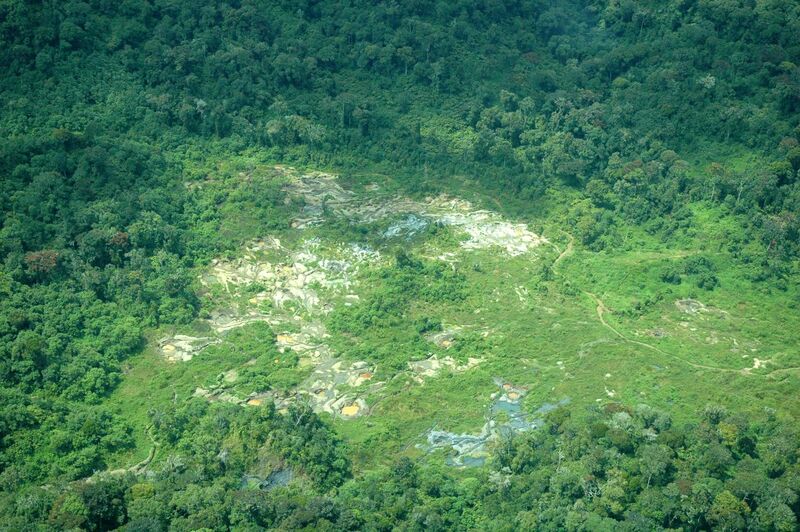 We are more certain that our biodiversity will continue to decline with current funding levels. Every State of the Environment report shows ongoing biodiversity loss at relatively stable, low-level funding. And what will happen if industry won’t open its wallets? Will the government close the funding gap, or shrug its shoulders, hoping the delay between committing a species to extinction and the actual event will be long enough to avoid accountability? In the past few years we’ve seen the extinction of the Christmas Island forest skink, the Christmas Island pipistrelle, and the Bramble Cay melomys with no public inquiry. Academics have been left to probe the causes, and there is no clear line of government responsibility or mechanism to provide enough funding to help prevent more extinctions. Another problem is the prospectus’s bias towards the cute and cuddly, reflecting the prejudice in the Commonwealth Threatened Species Strategy. The strategy and prospectus make the assumption that potential benefactors are inclined to fork out for a freckled duck, but not for a Fitzroy land snail. The prospectus includes almost half of Australia’s threatened mammals (listed under the Environment Protection and Biodiversity Conservation Act) and one-fifth of the threatened birds. Other groups are woefully represented, ranging from 13% of threatened reptiles to just 1% of threatened plants and none of the listed threatened invertebrates. The prospectus does not even mention spectacular and uniquely Australian threatened crayfish, snails, velvet worms, beetles, butterflies, moths and other insects. The allocation of funds is equally problematic. We found that birds received the most money (A$209,000 per species on average), followed by mammals and plants. 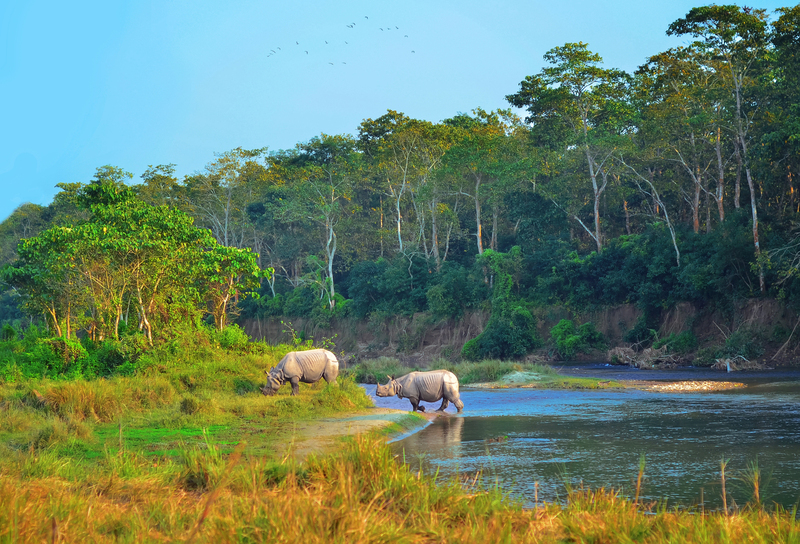 Raising new funds to help save iconic species is valuable, and can help other species. This focus on birds and mammals wouldn’t be a problem if the government were to pick up the tab for the less popular threatened species. But it hasn’t. That means our threatened species program will continue to be exceptionally biased, while many more species vanish forever, with little acknowledgement. We think that the prospectus, despite its biases, is a positive initiative. It is vital to engage society, including business and wealthy philanthropists, in the care of Australia’s natural heritage. But it also highlights how little the government is willing to invest in preserving our threatened wildlife and ecosystems.